MORTGAGE BROKING continues to stand out as an attractive industry for young Australians. This year’s 30 Under Thirty ranking included a whopping 13 new entrants, some of whom have only been in the business for 12 months. Connective was home to the largest number of young guns this year (8), followed by AFG (5), Choice Aggregation Services (4), Mortgage Choice (4), Loan Market (3), eChoice (2), FAST (2), PLAN Australia (1) and Specialist Finance Group (1). Brokers were ranked based on their total volume of residential loans over the 2017 financial year, the number of mortgages written over that period and the total volume of other loans written. Residential loan volumes were given a greater weighting. In December 2017, The Adviser, in partnership with principal partner Connective, hosted the Rising Stars event in Sydney to reveal the ranking and celebrate the achievements of the industry’s best and brightest. You’ve topped the list once again. How has business been over the last 12 months? One of my staff has become a broker now. I’ve also brought on two young interns who want to become brokers. I’m basically teaching them everything I’ve learned over the last six years. It is a bit different from what I have been doing previously. Before, it was all about George. Now I’m focused on training up my team and getting them across our processes. What has the training involved? I’ve written training manuals and I do sessions with the team where we run through scenarios and I teach them how to be a broker. In previous years, I didn’t have the patience or time to do that. Today, I have the staff , I have the patience and I have the time. Best of all, I’m really enjoying it. I’ve accepted the fact that I can’t do everything and I need to teach others for the business to grow. How many staff do you have in your team now? I’ve got two 21-year-old interns; my manager, and my mother, Helen; then I have Nicole, who is a broker now; and we’ve got Josie, who is a mortgage support officer. Tony is our self-employed specialist, who works for us part-time. Over the last few months, there has been a lot of role changing in the business. What are your plans moving into 2018? I probably won’t be writing as many loans myself next year. I’ll be training and mentoring the young guys, making sure that my business runs really smoothly. I’ll also be focusing more of my time on Trycall, our technology business that provides brokers with a direct-to-voicemail service. THE LAST 12 months have marked the start of a new era in the Australian mortgage broking industry. 2017 showed us a future where rapid regulatory change, heightened scrutiny, increasing consumer expectations and technological advancements are the new normal. A future that will be owned by innovative, resilient and customer-focused mortgage brokers ready to turn change into opportunity. 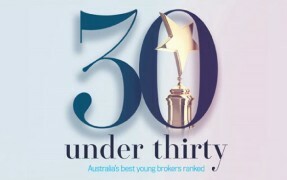 Like those mortgage brokers we are recognising in this year’s 30 Under Thirty feature. Connective is proud to support the industry’s rising stars and leading young brokers, acknowledging that it is brokers with a solid customer focus that will continue to thrive and succeed. We play a key role in equipping mortgage brokers to thrive in our industry’s bright and dynamic tomorrow, and we’re delighted to support activities that grow and build the professionalism in the mortgage broking industry. Congratulations to this year’s top 30 Under Thirty. We look forward to seeing your persistent success as you continue to embrace change, add value to your customers and pursue growth.